Mitchell Stephens, Ph.D., a professor of journalism at New York University who brought to life the charismatic and groundbreaking early-20th-century journalist Lowell Thomas was honored on Nov. 14 with the 2018 Ann M. Sperber Prize. 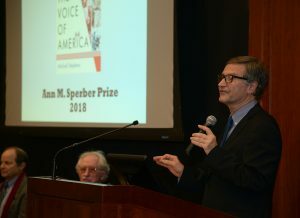 The award, which was presented in a ceremony at the Lincoln Center campus, was given to Stephens for his book The Voice of America: Lowell Thomas and the Invention of 20th-Century Journalism (St. Martin’s Press, 2017). Like the Anderson Cooper of his day, Thomas is the patron saint of roving news correspondents, said Stephens. In accepting the prize, Stephens spoke fondly about his subject, particularly his zest for going literally anywhere in the world for a story. “He had tremendous spirit, he was a nice man, he was kind to everyone he met, he was interested in everybody he met, and he had this amazing desire to travel, to go there, to put his feet on the ground. It was a real pleasure to follow in his footsteps,” he said. Joseph M. McShane, S.J. president of Fordham, congratulated Stephens for writing what he called a “lovingly objective” biography of Thomas, who worked in radio from 1930 to 1976, hosted the first-ever television news broadcast in 1939, and traveled to the furthest corners of the globe to report news stories. 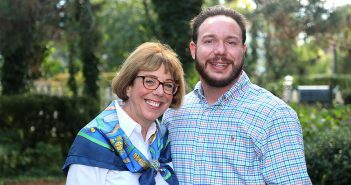 He singled out Thomas’ granddaughter Anne Thomas Donaghy, who was in the audience, as an honor for Fordham. “Thomas was an iconic figure whose life is now recorded in masterful prose, in a magisterial way, with affection for the subject,” Father McShane said. Ron Simon, television curator for the Paley Center of Media, told the audience that although Thomas is not as well remembered today in journalism circles as figures such as Edward R. Murrow, he was the most famous journalist of his time. While Thomas is perhaps known best for discovering and promoting T.E. Lawrence, AKA “Lawrence of Arabia,” Simon said Stephens made a convincing case that Thomas helped set the standard that contemporary journalists strive to uphold. “Thomas began his career as a captivating lecturer, using slides and films, sometimes stretching the facts to fit the morals of his stories. But when he commenced his nightly news broadcast when he was 40 years old, he wanted to report the news right down the middle, and not to let anyone know his political persuasion,” he said. 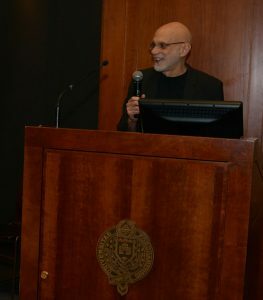 Rick Moulton, director and producer of the documentary The Voice of America: Lowell Thomas and the Rise of Broadcast Journalism, which Stephens appears in, noted at the ceremony that while he was reviewing thousands of visuals for the project, Stephens was tracking down endless written details about Lowell’s life. “While the paper trail offered a verifiable record, Mitch understood the journalistic principle that if you want to understand the story, you have to walk the ground. So he did just that, literally following Lowell’s life around the world, from Greenville, Ohio, to the gold camps of Colorado, the west side of Chicago, up to Alaska, on to London, the Middle East, India, Nepal, Tibet, and finally Australia,” he said. Stephens, left, credited Rick Moulton, center, with motivating him to write a biography of Thomas. Stephens, whose children and grandchildren were present for the ceremony, and whose previous work has delved into the history of journalism, said that Lowell had always floated at the edge of his consciousness. But he only considered writing a biography when Moulton, who was with Lowell the day he died in 1981, asked him to be part of his documentary. He said the Sperber award held special significance for him. The Sperber Prize was established by Liselette Sperber to honor the memory of her daughter Ann, who wrote the definitive biography of Edward R. Murrow, Murrow: His Life and Times (Freundlich, 1986). 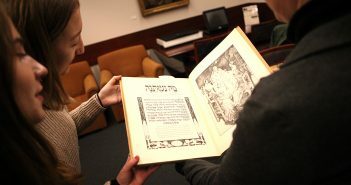 It is administered by Fordham’s Department of Communication and Media Studies. 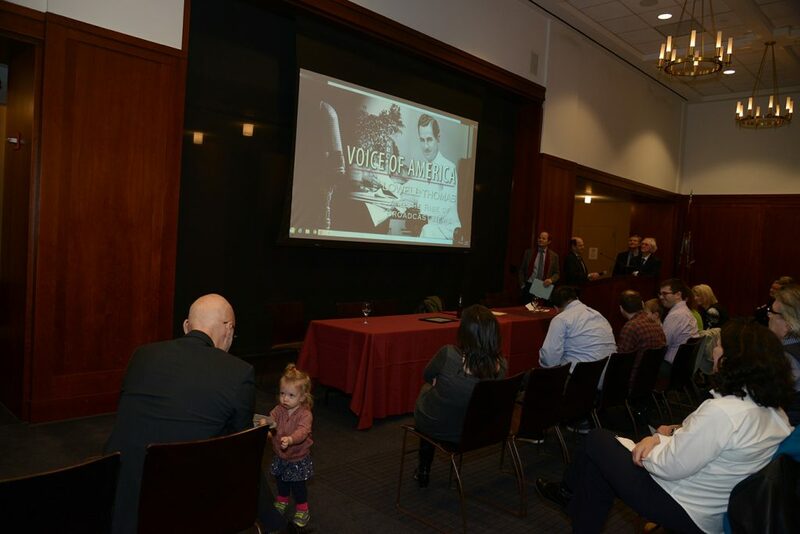 Audiences were treated to a three-minute screening of Moulton’s documentary The Voice of America: Lowell Thomas and the Rise of Broadcast Journalism.